Lightcliffe is a village in West Yorkshire, England. 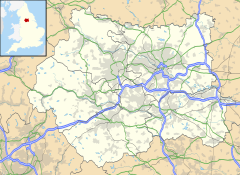 Historically part of the West Riding of Yorkshire, it is situated approximately three miles east of Halifax and two miles north west of Brighouse in the metropolitan district of Calderdale. It was created a separate parish in 1846. Lightcliffe is a dormitory village for people working in Halifax, Brighouse, and Bradford, and commuting to Leeds, Manchester, and Sheffield. It stretches along the Wakefield and Leeds roads, surrounded by fields and rolling countryside. Lightcliffe feels very established and green – with many mature trees and large houses. Lightcliffe's main park, "the Stray", is 11 acres of lawn and trees and contains a war memorial erected in 1923. In April 1937, an avenue of trees was planted in the park to commemorate King George VI's coronation. Towards the village centre is the cricket club. There are two golf clubs, the long established Lightcliffe Golf Club and Crow's Nest Golf Club. The oldest part of the village contains the Sun Inn – a former coaching inn, along what was in antiquity the main road to London. The new Lightcliffe Anglican church, St Matthew's, was built in 1875 to replace the old church. It is a Gothic Revival building, with an embattled parapet which is reminiscent of a medieval castle. On Leeds Road is situated the URC church – now converted to offices. A feature of this church is that it contained a peal of bells – unusual for a nonconformist church. It has a tall steeple and stained glass. The church congregation has joined with Hipperholme Methodist Church to form a Local Ecumenical Partnership worshipping at Christ Church at the main Crossroads. Lightcliffe Academy is a secondary school serving the area. Lightcliffe Church of England Primary School is located in an old stone building and Cliffe Hill Primary has newer premises. Sir Titus Salt, a wealthy businessman known for his factory at Saltaire once lived in Crow's Nest Mansion. ^ "Hipperholme & Lightcliffe High School and Bogra Govt Girls' High School partnership". British Council. Retrieved 3 December 2011. ^ "Lightcliffe". Online Visual Archive of Calderdale History (calderdale.gov.uk). Retrieved 7 December 2011. ^ "Profile on...". Yorkshire Post (9 May 2011). Retrieved 3 December 2011. ^ a b "Stray (B) Lightcliffe". Online Visual Archive of Calderdale History (calderdale.gov.uk). Retrieved 7 December 2011. ^ Historic England. "Church of St Matthew (1300120)". National Heritage List for England. Retrieved 1 March 2014. Wikimedia Commons has media related to Lightcliffe. This page was last edited on 4 October 2018, at 14:21 (UTC).